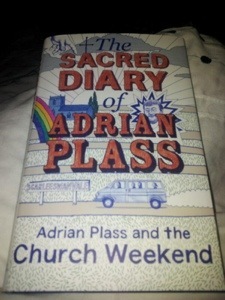 Have read a lot of Adrian Plass recently. Completely compelling writing, tongue in cheek at times but also quite pointed. Has made me think a lot about Christianity and church. ‘The Church’ to the outside world is often viewed as a place full of pious, out of touch people who closet themselves away on a Sunday, sing hymns and feel that they are superior to everyone else. TV does little to dispel this myth. Have seen a couple of dramas recently where the Christian character comes across as a ‘weirdo’. One of the most high profile churches in the media is Westboro Baptist known for their messages of hatred. Church in reality is very different. I tweeted on Sunday that I had really enjoyed church because it felt like family. Now when we consider the word family, we think of different generations, personalities, characters etc who all get together and spend time together because they are related. For me, church is the same, I spend time with people of different ages to me. I love the fact that my friends would not be considered my peer group. I have learnt so much and been really supported by having friends of different ages. This is something that is often missed out on. Also, like family there are times you fall out, people get on your nerves and it can be strained but ultimately what unites us is so much stronger than that. There is a shared mutual love and support and an inbuilt support system when things are tough. Sometimes we get things wrong and that is because we are all broken, messy people. We don’t have it all together but we do have each other and recognise that we are better together than we are apart. It is not an exclusive club it is an inclusive club. Sadly, many people will not set foot in a church because of misconception, because of the message that has often been heard, because of silence when there should have been words. Ultimately we are called to love and we all need to get that little bit better at doing just that.